If you have never heard or seen a performance by Clann An Drumma, then you may be left wondering just who exactly we are? It's simple really, Clann An Drumma means "Children of the Drum" - and that's exactly what we are - an exciting, energetic and rhythmic band, from Glasgow in ScotlandOur music has been passed down to us from our ancestors and is dominated by rhythm, enhanced by the skirl of the pipes, flavoured with enchanting vocals and wrapped in the warmth of our country . On first impressions, you might think we are "just another Scottish pipes and drums band" - but when the percussion kicks in, you will soon realise that is not the case. Clann An Drumma's thunderous approach to percussion gives a brilliant new flair to those traditional pieces - and brings a whole new style of music to your home . Why not explore our; website, meet the band, check out some sample tracks, view our photo albums, browse our community forum, or catch up on the latest with our fans in the LIVE chat Whatever you do, have fun and KEEP IT TRIBAL !! Comments: Was that for the caption contest. I wish I did win that but no luck. I did win a very nice Prince Charlie outfit from Frugel Kilt Corner through the Brotherhood of the Kilt last year. I'm going to check out the CAD site and see what's going on. I need new music! Comments: Yay!! New contest I hope. Write about Clann An Drumma! Want to write a review about Clann An Drumma's music? Or perhaps you would like to share your experience of seeing Clann An Drumma in concert. Feel free to use the following form to post your reviews, comments and thoughts concerning our featured artist! 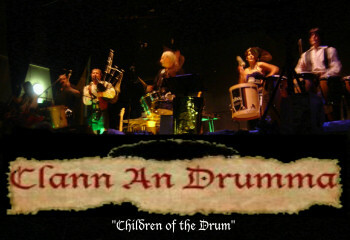 Please login to write your comments about Clann An Drumma.